Description: Hand-Crafted Hilt specifically made for wearer's hand. Unique. 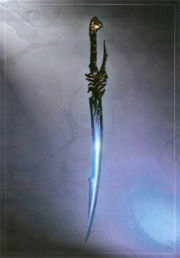 Blue blade crackles with Celestial [Aether] Energy, concentrated life-force of billions. Effects: Being a weapon, it can take life, but it can also restore life -if enough blood is given in payment or, on occasion, a life for a life. Can charge enough to release a concentrated burst of Celestial [Aether] Energy, which can rent a hole in the fabric of space-time. Allowing for quick, emergency-only, transport to another reality. Second Ability rarely used due to risk of destroying fabric of universe, in a very, "Universe Go BOOM!" Kind of way. History: After venturing out into the world of Artegal, with T'ylah, Sphyria discovered a Portal which lead to the center of the Space-Time Continum, where the undefined beings there crafted the finest blade of Universal matter for her. Description: Mildly Revealing but quite sturdy. Enchantments: Can channel Lightning, for Angel's Fury. History: Created by the Crystal-born of Asterea, the dark metal was drawn from the rrocks surrounding the great crystals, from all over Artegal. Giving it special properties. Blessed by the same race who made her balde. Breastplate was made for T'ylah. Okay, I'm sorry if it's not made clear, but, Soul is a heavily restricted element. At the moment, only Dullahan can use it, for anything. You wrote: Being a weapon, it can take life, but it can also restore life -if enough blood is given in payment or, on occasion, a life for a life. Okay... So, this thing heals you when you land an attack? Second Ability rarely used due to risk of destroying fabric of universe. ...I have no idea what this is. Is it teleportation? Or a "reality goes boom" thing? (Also, once you make Ty'Lah as a party member, you'll have to make another one of these, for her. Celestial is not an Element. If you're wanting something dealing with the stars? That'd be Aether. As for its abilities... It, basically, boosts the power of Lightning-Elemental Magic, and lets you breathe whilst underwater. However, we have a HUGE Problem. To start with, it's Fireproof. That's fine. Realize, though, that, you're going to take double damage from Water. ...But, your armor lacks a Fire element? Even if you added the Element, Fireproof would need to be an Enchantment. Which, w/o upgrades, you can only have two of. Okay...so Aether element for weapon, not soul, Galactic Oblivion can cause a gigantic 'Universe go Boom' explosion, or teleport you. Rarely used except in great need, as it's more likely to swing in the 'Doomsday' Direction. Armour, okay, kind of have control over water anyway, so I can cut out the waterbreathing thing. Fire-proof, it kind of has to be as Sphyria is, and she tends to extort that ability...a lot!